VOLUME 1. A. FUNDAMENTALS AND GENERAL ASPECTS. A.1 Physical, Chemical and Petrographic Characterization (91 papers). A.2 Structure and Chemical Reactivity (35 papers). B. COAL COMBUSTION AND CONVERSION SCIENCE. B.1 Combustion and Gasification (80 papers). B.2 Pyrolysis and Carbonization (89 papers). Author Index. VOLUME II. B.3 Liquefaction and Hydropyrolysis (85 papers). COAL AND THE ENVIRONMENT. C.1 Pre-Utilization Aspects (55 papers). C.2 Utilization and Post-Utilization Aspects (60 papers). Author index. 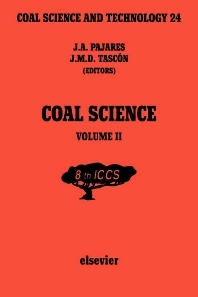 This volume contains papers presented at the 8th International Conference on Coal Science, held in Oviedo, Spain, September 10-15, 1995. Volume I contains papers dealing with Fundamentals and General Aspects, Combustion and Gasification and Pyrolysis and Carbonization. Volume II covers papers discussing Liquefaction and Hydropyrolysis and Coal and the Environment. The scope of topics covered will give the reader a state-of-the-art impression of coal characterization and depolymerization, coal-derived carbons, coal carbonization and liquefaction, and the progress towards making coal an environmentally acceptable fuel during its combustion in electricity production. The use of modern physicochemical characterization techniques has advanced knowledge of coal composition and structure enormously in the last twenty years, and it is hoped that coal will enter into the next millenium as a clean and efficient fuel. Juan M. D. Tascón graduated in Chemistry from University of Oviedo, Spain and in 1981 received a Doctor degree from Complutense University, Madrid. With the only exception of two postdoctoral stays, one in Belgium (Univ. of Louvain, with Prof. B. Delmon) and another in the USA (New York University, with Prof. M.J.D. Low) he has spent his entire career at the Spanish National Research Council (CSIC), first at the Institute of Catalysis and Petrochemistry (Madrid), and, from 1985 on, at the National Carbon Institute (Oviedo) where he is now a Research Professor and Director. His work has been mainly focused on the surface properties of carbon materials such as carbon fibers, activated carbons (and porous carbons in general) and, lately, graphene. He has published over 250 papers in refereed journals and has edited three books. Juan is serving in the advisory editorial boards of Fuel, Journal of the Argentine Chemical Society and Recent Patents on Materials Science, and is an Editor of Carbon since 2012.